Why is it so difficult for people who live in Ontario to eat fruit that is grown in Ontario? 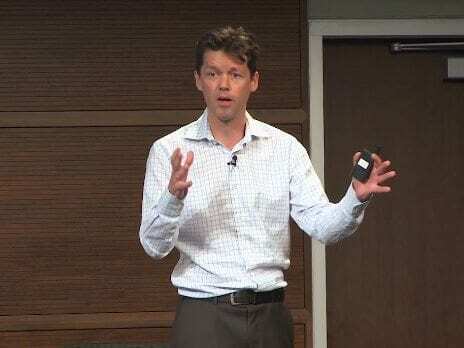 In this talk, Joeri van den Steenhoven, director of MaRS Solutions Lab, explores this challenge, along with some of the other challenges that the Canadian food system is facing. Look in your refrigerator. What percentage of your produce is locally grown? Likely little. Having a local, healthy and sustainable food supply not only helps promote personal health but the overall health of our communities. Take this example: A 2005 report by the Region of Waterloo found that 58 commonly eaten foods such as apples, tomatoes and potatoes travel an average of 4,497 km to get to the region. This accounts for 51,700 tonnes of greenhouse gas emissions annually, contributing to climate change and air quality, which in turn have an effect on people’s health. The challenge with the current food system is that it is designed to maximize profits through cheap food imports. It’s a system that is measured in volume rather than in the value it provides to consumers. Health: The increase in chronic diseases stresses the need for healthier eating, which in turn puts pressure on food production. Employment: The food system’s labour market is changing fundamentally, with an increase in food services and a decrease in food production. Environment: There is a need for sustainability in food production, processing and distribution to keep food supply intact. Ontario Tender Fruit Lab: MaRS Solutions Lab is working with fruit farmers, retailers and processors to acquire a better understanding of the obstacles being faced in the tender fruit value chain. The lab is organizing workshops with stakeholders, experts and innovators to develop interventions that will make this system shift happen. Food and Beverage Innovation Centre: MaRS is a program partner of a new large-scale food incubator and innovation centre that will help deliver services to food companies. Watch highlights from Joeri’s talk below to learn more about the future of food. Watch the full presentation here.